The responsibilities of training young horses should not be underestimated. 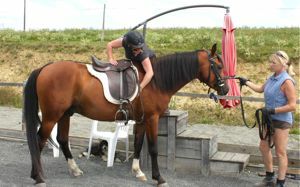 The first training experiences, both physical and psychological, will form a horse in certain ways for his entire life. Experience is a great asset, but only when that experience has been acquired as a consequence of a basic love for horses, resulting in a considerate and intelligent approach. If young horses are introduced to horse training equipment in a clumsy or a careless way, they can easily develop evasive or fearful reactions which may appear straight away, or may remain dormant and only manifest themselves when the horse either reaches the point of overload, or alternatively feels confident enough to express himself. 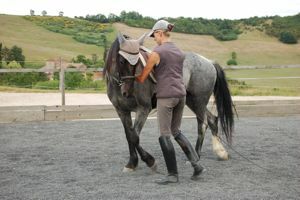 Using tack which is either badly fitted, the wrong size or the wrong type for that horse will negatively influence the delicate balance of trust in your relationship, as well as encouraging negative associations, which can be difficult, if not impossible, to re-train. Of course all these points apply to all horses, but everyone has to learn, and we are always learning and making mistakes. The point about training young horses is that they are completely susceptible to what we are doing with them. Often they will have had no previous exposure to working with people, and therefore they have no perspective which can help them to understand if you make some mistakes. It is true that many if not most older horses have built up certain defenses against such mistakes, which will protect them, even though their relationship with people may not be ideal. Realistically also, if they are still around, such horses have therefore been able to cope with a certain level of ignorance from people and they have survived it, whereas not all horses do. It is better therefore, to make your gravest mistakes with horses which are less vulnerable and also have less potential, and save your clean sheet for when you will make the best job of it. Unfortunately, good-will on its own does not suffice when it comes to training young horses. You need years of practicing handling and riding skills before you will make a success of a three year old, even an angelic one! Unfortunately until you have those years of correct training yourself, you won't necessarily believe the importance of it. 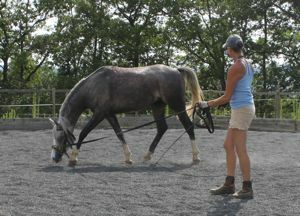 Training young horses requires considerable lungeing experience. 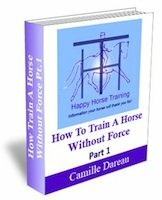 How to handle the line and the whip, and understanding how to teach your horse to be lunged are just the beginning. After that, you must develop your analytical skills so you can see how your horse is moving and what gymnastic skills he needs to acquire, and then you have to know how to make that come about. 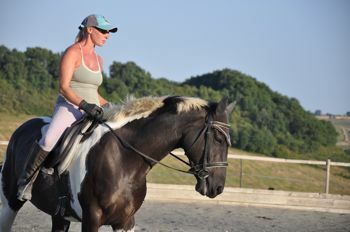 It is also important to have some idea of what it is fair to ask in a session of that particular horse, and whether your progress is reasonable, or if there is something you need to address outside of your training sessions. 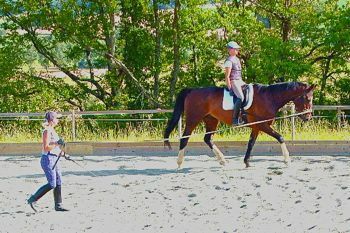 When you get to the point of actually riding your horse (which in our opinion should not be before several months of preparatory lungeing work to strengthen and develop the horses physical capacity to carry a rider) then it is even more important to have achieved stability in your own posture, so that you will be able to help to balance your youngster as much as possible, and build his confidence and sensitivity to the aids over time. It is important for you to have a well developed perception of your own straightness, otherwise you will end up being made crooked by your horse, instead of straightening him! Training young horses is particularly difficult when it comes to knowing when you have done enough. In fact young horses themselves have no experience of how much is enough, and often continues to accept demands made on them long after the work is actually advancing their training. This is because the training process requires growth. If you train your horse correctly, even for a short time, afterwards (as long as he is in good condition) his body will make many desirable changes in the musculoskeletal system. These changes are only stimulated to the maximum when the horse is calm during his work and remains fresh enough energetically. The most common mistake people make when training young horses is to overdo it. 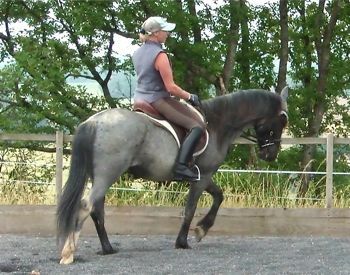 The signs of when a young horse has done enough are extremely subtle, and are often only available to your intuition. If they are ignored time after time, the trust between you will be eroded and the physical development will be derailed. Muscles will become more tense and develop in the wrong way and joints will be put under strain. This derailing process can last for many months until more obvious signs of resistance begin, such as napping and rearing, or refusing to move at all. We have retrained several horses who had reached this impasse and they have all made a full recovery as a result of many years of patient trust building and addressing of their physical and emotional issues. 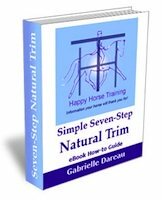 This brings us to the next section which briefly covers the other important attributes, as well as experience, which are indispensable for successfully training young horses. It is true that we are all born with certain personality traits which are more natural to us than others, but we believe that your aspirations in life are more important than your starting point. Exactly like horses, if we can bring out whatever potential is there in any horse, that is one of the deepest fulfillments possible, and very different from continually searching for the 'right horse'. In fact the best way to bring out the best in your horse is to look inside and bring out the best in you. Everyone is capable of evolving themselves, and the higher your motivation, the further you can go. Patience, first and foremost. If we are patient in our outlook then we diffuse an atmosphere of calm, and we give ourselves time to realize the answers to problems which may arise, as well as giving the horse time to find the responses we want. Everyone knows how difficult it is to please an impatient person, so imagine that from the horse's point of view. They will enjoy their sessions with you if you give them time, and make things seem as easy as possible. Confidence. 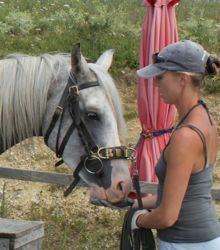 If you are frightened of your horse you must admit that to yourself, and decide whether you are willing to resolve it. If you can't resolve it, it is better not to continue, because a horse will never trust someone who fears him. On the other hand, it is quite possible to overcome such fear with the right support and understanding of the situation as a whole. Often horses in pain engender fear in their rider because they simply aren't safe to ride, and it would be abnormal on the part of the rider not to be afraid. It is important to be a confident person around horses in general though. A confidence which is based on love for them, and not the need to dominate them because of insecurity in oneself. Training young horses demands a very strong trust connection which can only be achieved when you are accepted as the leader, and you may have to raise your vibration quite high with some youngsters to be respected as such! There are ways of doing this which do not have to involve losing you temper or teaching your horse tricks or 'games'. Intuition and intelligence. The reason why you can read as many books as you like and somehow it still doesn't seem to work is that every situation you meet in your life is unique, and the answers can only be found through accessing the intelligence which is available to all of us through our intuition. Of course, there are general structures and concepts which apply in every case, but it is how and when to apply them that is specific to each situation. If you are really motivated to succeed in training young horses you must develop your innate intuition in any way that comes to you. People who don't do this will never achieve any true level of handling or riding ability because they are fundamentally blind to what is happening for them. Horses, remember, have an exceptional intuitive ability on the whole - especially when they live as they should do (see Horse Health: A Holistic Approach), and if you can't see and feel what is going on, you are already in a position of ignorance, and they won't respect you for it. Developing your intuition goes hand in hand with learning correct technique. What we think we are doing when we begin riding or training horses is often quite different from what an observer would think! This is because we need to align our senses properly when we are learning a difficult new skill. This takes time and effort and trust in our instructor. In fact the more sensitive you become in your technical skill, the more your intuition is liberated - as long as you are not limiting that side of yourself in some way. Remember that riding is a living art, and whenever we are riding we are also training our horse. There is no neutral position, no matter how much of a schoolmaster we have. Of course our influence tends to be greater the younger and less experienced the horse is, but whenever we handle or ride our horse, we are forming both ourselves and him for the future. This is why it is so important to base our methods on gymnastic truths and a fundamental love of horses, because we will always manifest our deepest values in our horse. 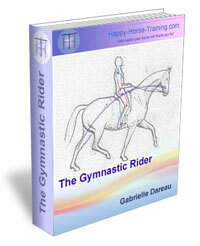 This philosophy is the basis for HHT's eBook How To Train A Horse Without Force which shows you not only how to build a relationship with your horse based on mutual trust, but also how to build his gymnastic development in the way that promotes the wonderful phenomenon of engagement. What is Real Dressage Training?